Christmas is coming so close and the year 2017 is going to an end. To celebrate the holiday season, Exabytes is now running a special promotion on Domain, Hosting and VPS/Server services. From now until December 31st, 2017, go to Exabytes to register .COM domains or hosting/vps plans, you will get so much fun and if the luck is your, you may get them for FREE. 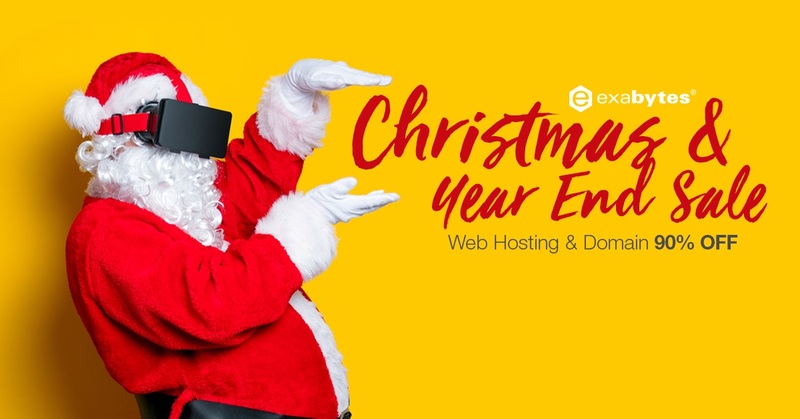 On Christmas sale, Exabytes keeps releasing a new coupon code – CHRISTMAS17 which helps to purchase .COM domain for only $3.99/year. Plus with 5 old working codes, at the moment, you can grab up to 6 cheap .COM domain names. I listed all of them in this post. Moreover, all domain successfully registered at this time will also get FREE ID Protection to hide your personal info for the 1st year. SSD WordPress Hosting and Powerful Shared Hosting plans are staying at just $12/year in this promotion. go along with any Shared Hosting package, you also get FREE SSL (https) & FREE Daily Backup. There is not much discount for VPS/Server this time. SSD VPS starts at $6.99/month – 46% off for all packages. BUT wait! Please don’t miss this special giveaway. Within 20th Dec 2017 to 31st Dec 2017, when spending minimum $10 at any of Exabytes’ services, you will have a ticket to join the lucky draw of this provider and have a chance to become the lucky one to get FREE .COMs and Shared Hosting. The result will be notified by email on or before 3rd Jan 2018. >> Click here to see more detail about this offer. I guess ExaBytes oversell their server’s resources. Usually they do not allow file hosting. In the other hand, they’re providing 100 GB of Storage web hosting at $0.99 per month. Any good web hosting provider will never do that. Because, cPanel/WHM license for a dedicated web server costs, $45.95 per monthly. Not only that, the server owner have to pay $11.95 per monthly for CloudLinux, $19.95 per monthly for LiteSpeed, $2 per monthly for Softaculous and there’s he/she have to pay more money without the costs of the dedicated web server. Also you know the costs of SSD / SATA / NAT / HDD storages. So how it is possible? 100 GB SSD storage at $0.99 per monthly? Huh?